A Perseid meteor blazes through the night sky near the constellation Cassiopeia, a celestial queen, in this eye-popping view. Astrophotographer VegaStar Carpentier took this stunning photo on Aug.11, 2012, in Épernay, Champagne-Ardenne, France, using a Canon EOS 1000D. The Perseid meteor shower has been observed by humans each summer for more than 2,000 years, It occurs when the Earth passes through debris left from the comet Swift-Tuttle. The dust and ice begin to burn when it reaches Earth’s atmosphere providing a fiery display for those who watch in late July or early August. The constellation Cassiopeia, named after a mythical Greek queen who boasted about her beauty, can also be seen on the right of the image. 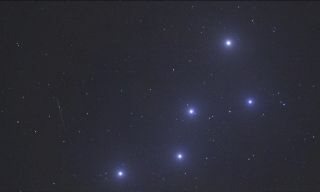 This constellation is easily recognizable due to its “W” shape and bright, glimmering stars.